Prime Minister Abbott today repeated a lie propagated by Dr. Napthine that inner city residents will benefit enormously from the link by removing through traffic from local streets. “Those precincts and communities and neighbourhoods will be returned to the people and they won’t be choking on traffic,” he said. 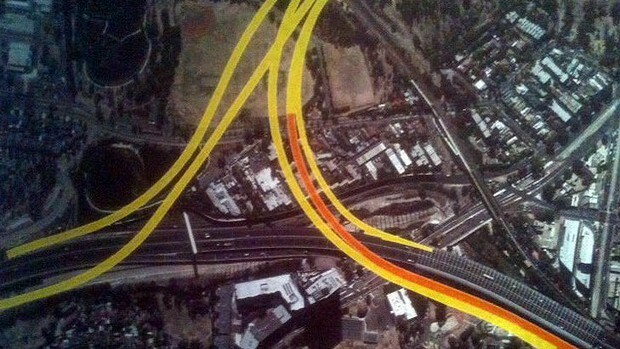 In fact, the project will make inner city congestion much worse. How much worse is not known, and when it is known probably won’t be published. Hoddle Street will be so congested it will be need to be expanded into a massive toll-way in a futile attempt to solve congestion. The project will do nothing for the inner city but attract more cars. Tony Abbott says he doesn’t need to see the east-west link’s full business case: “”I have no reason to think that the short case which has been published is in any way mendacious.” He doesn’t want to know how because if he did know, he wouldn’t be throwing $1.5 billion at it. Read the full article in The Age on this astonishing capitulation of accountability. It is totally unbelievable the sheer bloody minded irresponsibility of our politicians. From the motorists’ point of view, all this tunnel will do is shift the traffic jam from Collingwood four and a half kms west to North Melbourne and Parkville, where it will jam up on the crowded inner city road on the off/on ramps. The only beneficiaries will be the truck companies that will have a nice road subsidised for them by the motorists and taxpayers of Victoria. And let’s not forget the financiers/banksters who’ll make a motza from the fees and bonuses for financing this white elephant. Now bear in mind all those mum and dad investors who’ve lost billions through their funds or privates investments in this stampede of white elephants and also bear in mind that if the East-West private modelling (just like all the above white elephants) proves optimistic (which it will) Victorian taxpayers will be lumped with this money pit for decades under the “shadow tollway” provisions – otherwise nobody will build this lemon. The trucking companies and the banksters who’ll make a motza from the fees and bonuses setting up the financing. you are right, and the financiers are ensuring the stupid vic govt is borrowing at twice the typical interest rate and it’s taxpayer’s money to pay for it, for penalties in not meeting targets, and the tolls of course. The Vic Lib Party must be getting nervous about this vote loser, because if they had a choice, they will not build it. These financiers are the problem who has more money than they know what to do with.